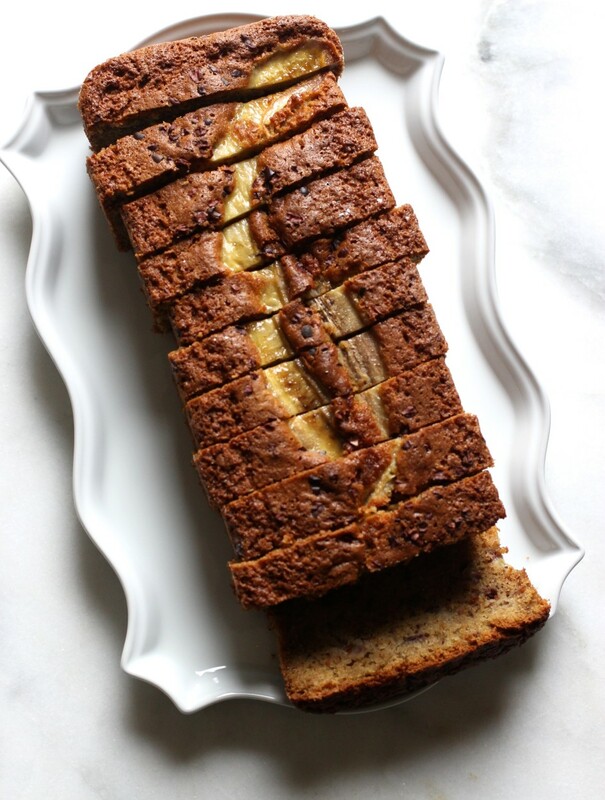 When I first made this I was looking to create an egg-free (vegan) banana bread in addition to gluten free to serve to our plant-based friend who was coming for brunch. I played around with a Williams-Sonoma recipe and viola, after two tweaked versions (theirs is not gf, df) I was thrilled with the results. I have made it many different ways over the years and it always comes through whatever the occasion may be – school snack, entertaining, gifting, teachers, etc. – my go-to loaf for sure. 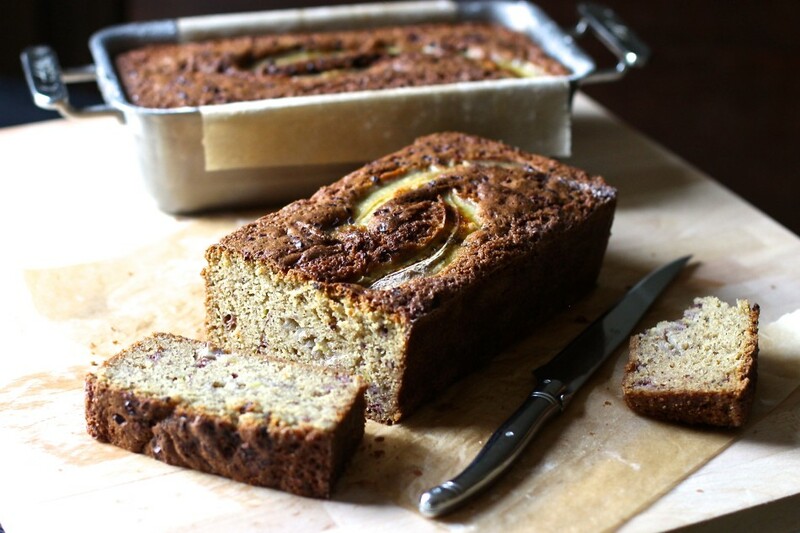 Bananas make a wonderful substitute for eggs, making baked goods so moist while giving it structure. I originally made this loaf with sweet crunchy pecans and it quickly became a hit with everyone and she loved it so much she took the recipe! 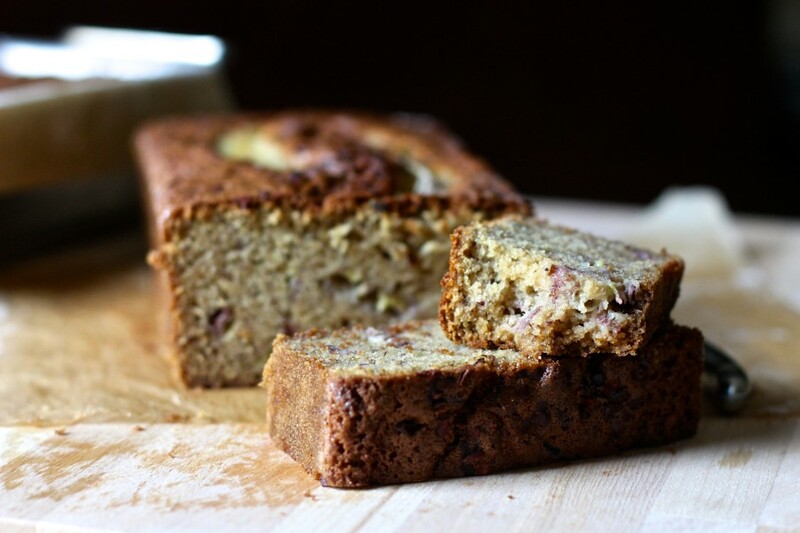 I tweaked my old 2013 recipe even further to include measured weights and simplified it by using fewer ingredients to not only keep it delicious but also more convenient and consistent, which is why I am re-posting my banana pecan loaf for my new(er) and improved banana loaf. After re-tweaking and making it for the hundredth time recently I realized it hasn’t made it on the blog. Sigh. My apologies for not sharing it sooner. This recipe is easily interchangeable to fit your needs and taste. Don’t you just love how laid-back it is? 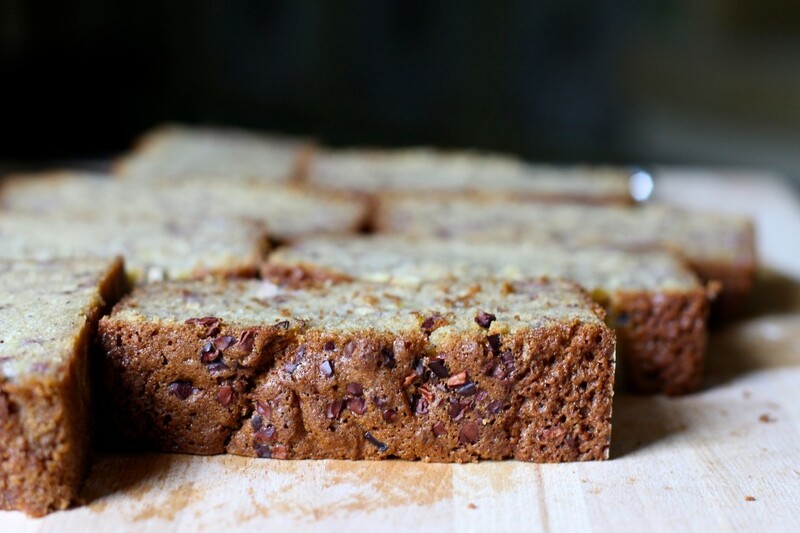 I happen to love all the nutrition even though it is a sweet recipe …full of potassium, protein, manganese (pecans), and fiber AND a great way to use up all those bananas lingering in the fruit bowl. 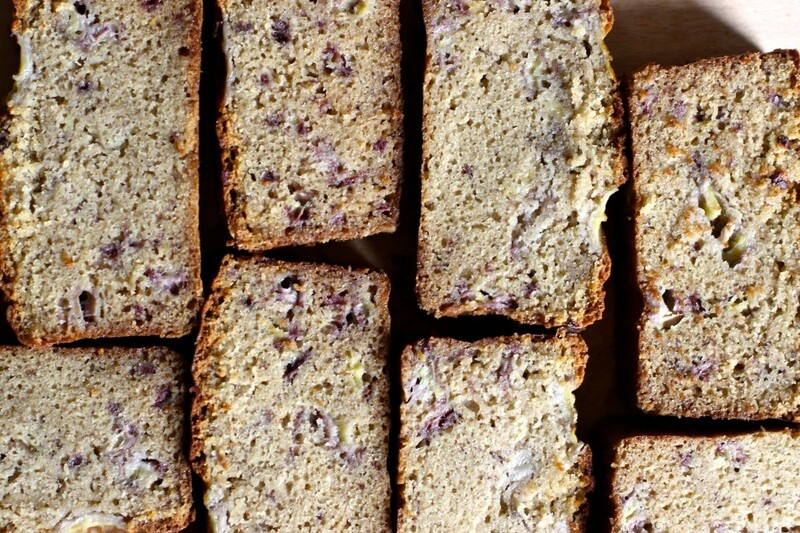 You won’t believe it’s gluten, dairy, and egg free. And I’m not just saying that. It’s also versatile enough to swap out for any nut, all sorts of berries, peaches, pumpkin, chocolate chips, what have you and if you choose to use eggs it can adapt easily – be sure to omit the applesauce if you do. My favorite is plain old banana with cacao nibs sprinkled on top. Yum. 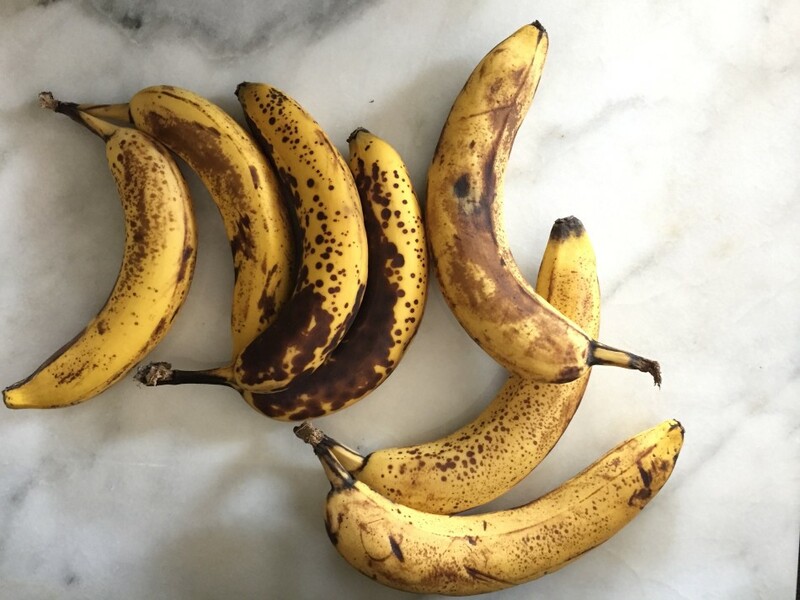 If you ask my boys what they prefer, they will always say chocolate chips or just banana. The boys and I love a slice as an afternoon snack; hubby always has a slice with his coffee in the morning. It goes quick, which is why the recipe makes two loaves. 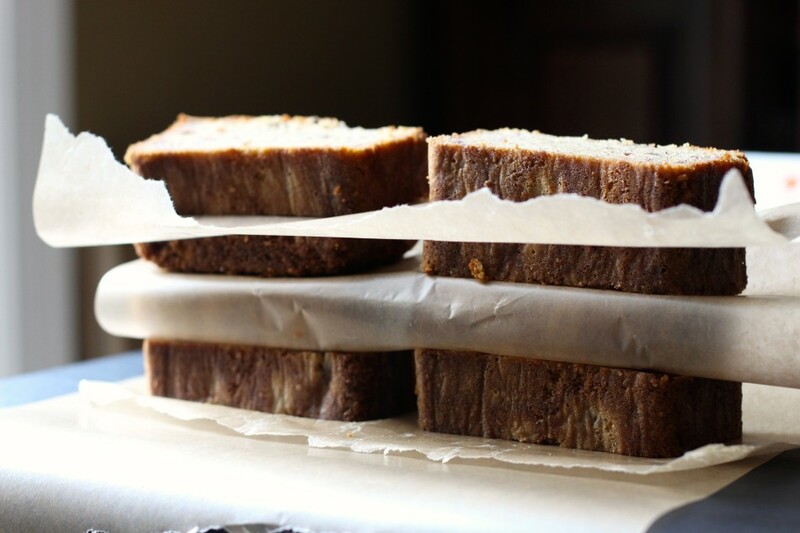 I pre-slice loaves then stack them between layers of wax or parchment paper and pack them in a container for freezing when I make extra batches to have on hand and just thaw them at room temperature for 15 minutes. And keep the other loaf out for grabs. Hope you give this one a try and enjoy it as much as we do! 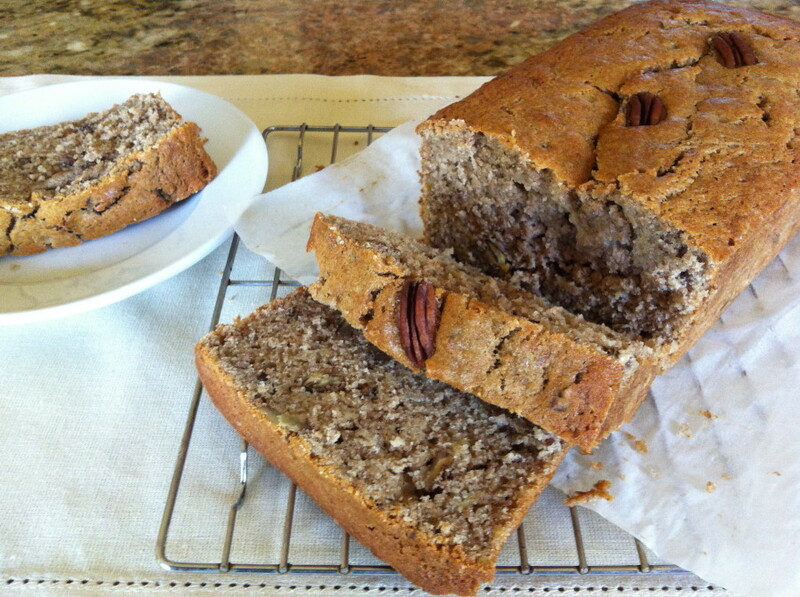 Tweaked my old 2013 banana pecan loaf recipe even further to include measured weights and simplified it by using fewer ingredients to keep it consistently delicious and more convenient using readily available ingredients. 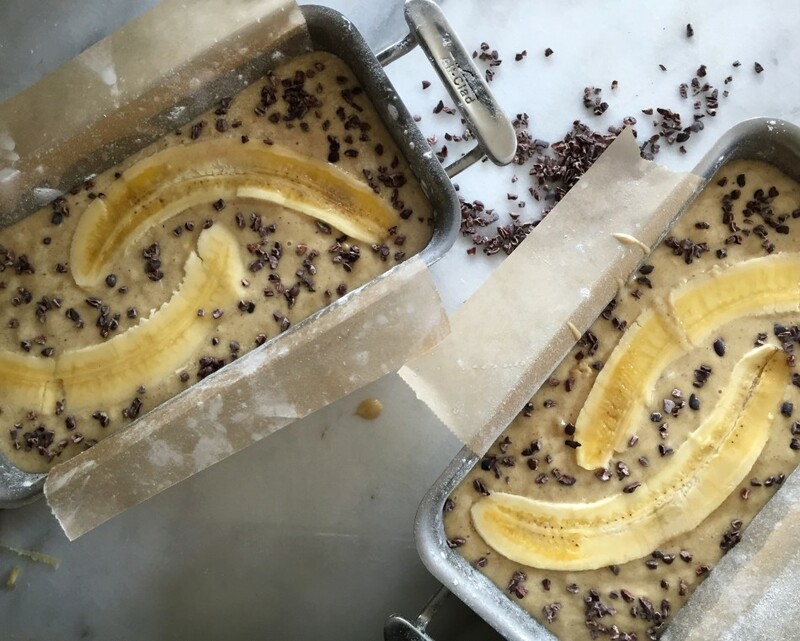 It's full of ripe sweet bananas, moist and perfectly delicious any time of day and so versatile (can be made as muffins as well) - freezer-friendly and allergen free too! Preheat oven to 350 degrees F (180 C) Lightly grease two standard-sized loaf pans then line with ½ a sheet of parchment paper with a slight overhang to keep the paper in place (placed on length side for easy lifting when done) then grease a little more where it's dry. For muffins: see note below. Toss 2 tablespoons of white rice flour with nuts or chips, if using, set aside (flour helps to prevent ingredients from sinking to the bottom). Combine all other flours, baking powder, baking soda, kosher salt, and nutmeg in a bowl, set aside. Measure coconut milk then add apple cider vinegar to the measuring cup, do not stir and set aside. This is the “buttermilk”. In a stand mixer set with the paddle attachment, cream the non-dairy butter and raw sugar on medium high speed (start on low to prevent sugar splatter) for 3 minutes until pale and appears light and fluffy. Reduce speed to medium, add diced (or roughly mashed) banana to creamed butter/sugar. Immediately after, add chunky apple sauce (or egg, if using, one at a time), and vanilla extract. Alternating liquid and flour: pour in half of the “buttermilk”, then half flour blend, followed by remaining “buttermilk” then remaining flour blend until just blended. Turn off mixer then pour batter into loaf pans two-thirds full. **If adding nuts, fruit or chocolate chips, fold in by hand until well blended then pour batter into pans. Bake for 55-65 minutes, or until a toothpick comes out fairly clean. If baking muffins see note below. Let cool for 20 minutes in the pans before serving. When cooled, separate the loaves from the pan using the dull side of a knife then pull out of the pans using the overhanging paper for support. Slice 1-inch slices with a sharp knife. Serve at room temperature. Store at room temperature, covered, for 2 days or refrigerated up to 4 days. Freeze for up to 3 months, pre-sliced then place slices between wax or parchment paper then transfer into freezer-safe container or freezer-safe ziploc bag. Mixing fruit, nuts, or chocolate chips with a little bit of flour helps prevent them from sinking to the bottom and well throughout the baked goods. Be sure to drain any excess liquid from applesauce that could thin out the batter. The batter should look like a cake batter - thick, not thin or runny, and slow to pour off the scooper. If it appears too thin, add 20 grams of either white rice flour or sorghum. Alternatively, swap out pecans for raspberries, strawberries, cranberries, chocolate chips, or any other nut, if you like - all these alternatives do well in the recipe. If using fruit suggested, be sure to pat any excess water before using. Some Notes on psyllium husk: Psyllium husk is derived from the seeds of the herb ovata, a bulk-forming dietary fiber that contains both soluble and insoluble fiber. If you like to bake sweets or bread I encourage you to give it a try. It works exceptionally well as a binder in gluten free baking and as a substitute to guar or xanthan gums; something I try to avoid when I can for health reasons. The soluble fiber in the husk binds to water (or any liquid) and gels up liquids, similar to what beans, peas, and seeds do, without imparting any gummy, chewy texture. It is also good for the heart as well as the entire gastrointestinal system (for healthy regularity). I buy Organic, non-gmo pharmaceutical grade whole psyllium husk from India that I grind, as needed, in my spice grinder (it’s really a mini Krups brand coffee bean grinder I bought at Bed Bath Beyond for $20- that grinds up my spices, flax, chia, and husk easily when I need them). Be sure to store it in a cool dry place, like flours, or it will cake up. Baking muffins: This will fill 16 standard sized cupcake liners (bake for 25 minutes) or 10 brown pannetone-style high muffin liners set on a baking sheet to prevent any mess (bake 25-30 minutes). The darker the cupcake/muffin pans, the faster they will bake. If using dark pans, check on them at the 20-minute mark. I use ceramic cupcake pans (sold on Amazon) that are white, those take the full 30 minutes to bake. A toothpick inserted should come out clean. This loaf looks terrific. I'm going over the recipe and had a question. What do you use to grease the pan? By the way, I love the detail you go through for each recipe and the tips you provide along the way. I have learned a lot and looking forward to more tips in the future. Thanks. Thanks so much Lisa, I use a grape seed cooking spray by La Tourangelle (found at Target!). It's soy free and doesn't leave any aftertaste. Hope you give it a try! Banana loaf is my husband's favorite but who needs all the chemicals in the store bought kind. Looking forward to making this recipe and know exactly what's in it. I also like the idea of making 2 loaves and freezing one. Thanks Jessica! So true! Yes, to making two loaves, it never lets me down. Hope you love it, enjoy! GORGEOUS! Need this in my life!!! I like your use of cacao beans, I add them to smoothie bowls all the time! Freezing slices for later is clever, I usually steer clear of making a big yield because I ended up with too much. Definitely on my baking list this week!! Thanks Sharon, hope you love it as much as we do! Enjoy!! OMG this looks incredible! I just saw this on IG and had to check out the recipe. Just got diagnosed with a gluten and dairy allergy and bummed about not eating my favorite foods but I see you have a bunch of amazing looking recipes on your blog that I can't wait to try. So not bummed now!!! 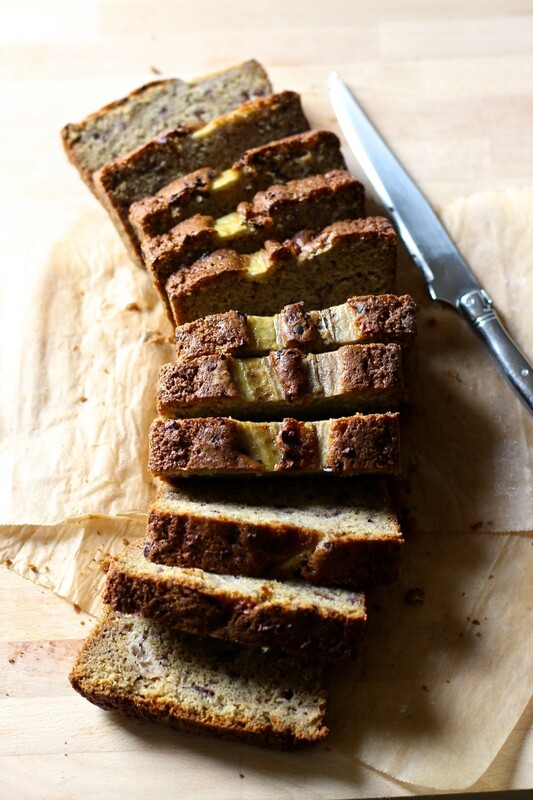 Baked your banana bread today and wanted to tell you how amazing it is!! I used eggs and added chocolate chips as you suggested and holy yum is it delicious. Thanks for my new favorite recipe and making this celiac, and soy free girl happy! YAY! So happy to hear you love it Justine, enjoy!! My mom was so impressed with my banana bread and the sliced banana on top. Thanks for this great recipe!! 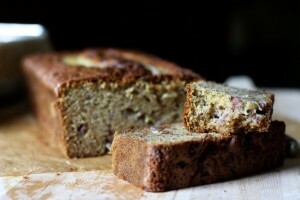 I found this recipe to be the best banana bread I've had and not only for gluten free. It is moist and flavorful. Will be making this more often!! Amazing! Just amazing! My husband had no idea it was gluten, dairy, soy and egg free! He gobbled it up. Thank you Jessica! This will be a staple in my house now. 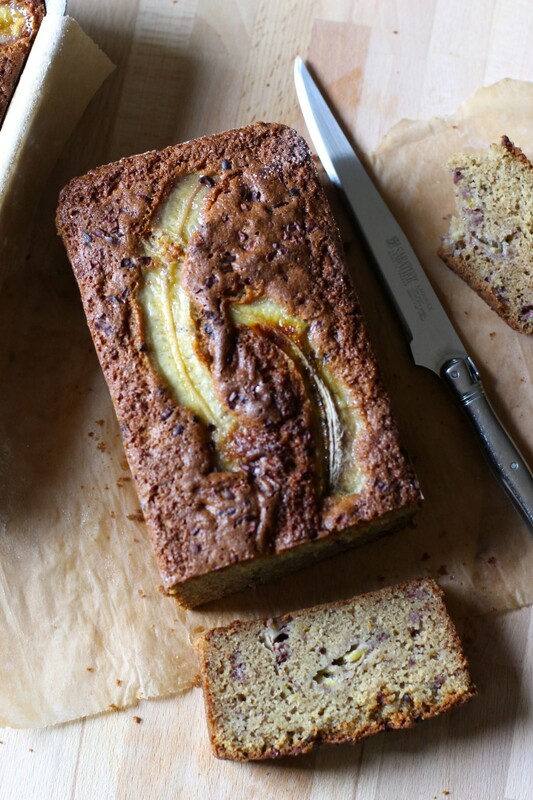 I have made many differing gluten and dairy free banana bread's to no avail, then I found your recipe with those stunning photos of yours and had to give it a try. I also put the sliced banana on top for pretty presentation and everyone couldn't get enough of it. It had such a banana flavor with perfect crumb and utterly delicious. A great recipe that I will be making again and again. Recipe turned out perfect! I would never believe this is gluten free AND vegan if I didn't make it myself!!! This is one of my favorite bread and I love your idea of putting fresh banana on top. Can't wait to try your recipe. Thanks for sharing.